Echo Buttons deliver a new way to play games with friends using Alexa. Enjoy hours of entertainment with compatible Alexa Skills like Button Monte, Beat the Intro from Musicplode, and Sounds Fun with Mike Epps from Ground Control. Echo Buttons are the first of many Alexa Gadgets, a new collection of accessories that enable fun and playful Alexa experiences. 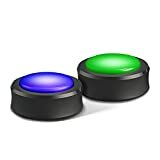 Bring back game night with a catalog of compatible Alexa Skills such as Trivial Pursuit Tap by Hasbro, Hanagram, Button Monte, and Don't Cut that Wire. Just ask "Alexa, what games can I play with my Echo Buttons?"